#1. Wow that’s cool, what is it? #2. You paint? My (fill in blank here… with) brother, father, mother cousin etc.. paints too, but their really good. #3 So, how much do you charge for a painting of this size? That much? #4 How long does it usually take you to paint a painting? (I’m thinking, not as long as when people don’t bother me). #5 You know what would be good in that painting, (pick one) A deer, a house, a hunter, seashells, fishing pole…Etc.. You get the idea. You can’t believe the suggestions! #6 I’d love to have a painting like this, but could you change (insert any of these) :color, size, format, subject matter, or all of the above. #7 What in the world are you doing out here? #8 I paint once in awhile, but I do real paintings, u know, oil? #9 So, what is this called? Water-color, yeah we learned to do that in grade school. #11 The name for this painting should be …___________________ The answer can be anything they dream up, then they act affronted when I don’t readily agree. I put these comments on my blog just for fun; don’t ever let people influence you not to paint. If you have any of your own silly statements, send them in as comments, I’ll be glad to post them. 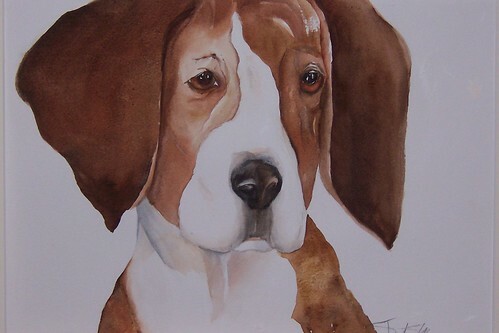 This entry was posted in A painting a day, art, Blogroll, Stuff that happens, watercolor by shanti marie. Bookmark the permalink. Love your Beagle… well done! Oh …. another one for me is when people come into my studio and see my paintings (very large and colorful) and say ‘Ohhh ….I lOVE your frames’. Very nice everyone and funny too. I’m sure I’ve said my share of dumb things too. “Oh you’re painting! I wondered what you were doing…I thought you might be giving away samples.” (she didn’t mean samples of paintings…I was using a tall wine barrel outside a wine shop as a table and she must have thought I had little samples of wine on the table. Too funny. I can identify with far too many from you list. I get number 2 ALL the time!